When Montreal landowner Stanley Clark Bagg (1820-1873) wrote his will in 1866, he tried to ensure that his wife, son and four daughters would be financially secure after his death. In this concern he was similar to many 19th-century Montreal husbands and fathers, 1 although he was in a better financial situation than most to make sure that this happened. He probably would have been surprised, however, to discover how his widow and daughters became actively involved in the family business. Stanley Clark Bagg (henceforth referred to as SCB)2 inherited extensive properties on the Island of Montreal from his grandfather John Clark.3 During his lifetime, he made money by leasing and selling that land. He planned his will so that these properties would generate income for three generations of his family. The will stipulated that, when lots from his Estate were sold, the new owner would have to pay a rental fee (called a rente constituée in French) on an ongoing basis. 4 These sums would benefit his widow, children and grandchildren. However, society was changing in Montreal and rente constituée was an old-fashioned idea. Property laws in the province of Quebec were modernizing, especially after 1840 when the seigneurial system of land ownership that dated back to colonial New France disappeared on the Island of Montreal. When his father died, son Robert Stanley Bagg (1848-1912) was just 25 years old and a newly graduated lawyer. He was suddenly thrust into the role of administrator of the Bagg Estate: effectively head of the family real estate company. In this role he seems to have relied to a great extent on the advice of his widowed mother, Catharine Mitcheson Bagg (1822-1914). Her brother McGregor J. Mitcheson, a Philadelphia lawyer, was an executor of SCB’s will and probably also provided advice. SCB’s widow was also still involved in decisions about the Bagg Estate some 27 years after his death. In 1900, Robert Stanley Bagg decided to retire from administering the estate. 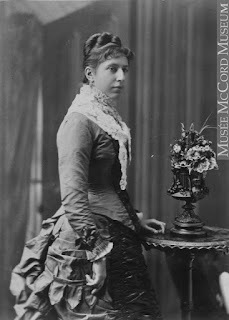 In response, Catharine Mitcheson Bagg wrote her son: “Dear Stanley, Acting upon your suggestion, I requested a family council and the Mills kindly invited all concerned to a little dinner…. We all came to conclusion that if McIntosh would accept the office of administration Bagg Estate, he would be the best man.”11 She went on to say that she planned to invite Mr. McIntosh to her house for a personal interview. But the family member who demonstrated the most longstanding interest in the family’s real estate business was daughter Amelia Bagg (1852-1943), wife of 1) Joseph Mulholland and 2) Rev. John George Norton. She started a ledger in 1891 to keep track of lots that had originally belonged to John Clark’s Estate, including Mile End Farm and the Durham House property, as well as other parts of her late father’s estate.12 She quietly recorded property sales, prices and interest payments for 36 years. 1 Bettina Bradbury. Wife to Widow. Lives, Laws and Politics in Nineteenth-Century Montreal. Vancouver: UBC Press, 2011, p. 169. 2. I refer to Stanley Clark Bagg as SCB in order not to confuse him with his father, Stanley Bagg (1788-1853), or his son, Robert Stanley Bagg (1848-1912). 3. Henry Griffin, “Last Will and Testament of Mr. John Clark of Montreal,” 29 August, 1825, # 5989, Bibliothèque et Archives nationales du Québec. 4. Joseph-Augustin Labadie, “Last Will and Testament of Stanley Clark Bagg, Esquire,” 7 July 1866, #156785. Bibliothèque et Archives nationales du Québec. 5. “An Act to authorize the Executors of the will of Stanley C. Bagg, Esq. late of the City of Montreal, to sell, exchange, alienate and convey certain Real Estate with substitution in said will, and to invest the proceeds thereof.” Statuts de la province du Québec, 38 Victoria 1875, p. 474-477. 6. Yves Desjardins, Histoire du Mile End. Quebec: Septentrion, 2017. 8. Katharine Sophia Bagg, Amelia Josephine Bagg, Mary Heloise Bagg and Helen Frances Bagg all engaged in the real estate business in their own names, primarily by leasing houses and selling lots. A search of their names in the “Quebec, Canada Notarial Records, 1637-1935” collection on www.ancestry.ca makes this clear. A search for their maiden names will bring up several dozen hits for each of them, including marriage contracts, sales, leases, loans and other records. In a few cases, the actual document has been digitized, but in most cases you can only view the notary’s index. See also Gail Dever, “How to order a notary record from the Quebec Archives after finding it in an index on Ancestry,” Genealogy a la Carte, Sept. 1, 2017, https://genealogyalacarte.ca/?p=20640 . In a previous post, Gail explained how to find documents concerning your ancestors in Ancestry’s Quebec notaries collection. See http://genealogyalacarte.ca/?p=16551. 9. O’Hara Baynes, Lease, 21 Jan 1897, #9938, Bibliothèque et Archives nationales du Québec. 12. Amelia J. (Bagg) Mulholland. Ledger, 1891-1927. McCord Museum, Bagg Family Fonds, P070/B07.